Few aircraft are as iconic as the McDonnell Douglas F-4 Phantom II. Its upswept wingtips, hulking fuselage, and twin J79 engines made it a memorable sight (and sound) around the world. Its success as an aircraft can be seen by the huge number produced, over 5000, and by the fact that it is still in service today with a handful of air forces worldwide. 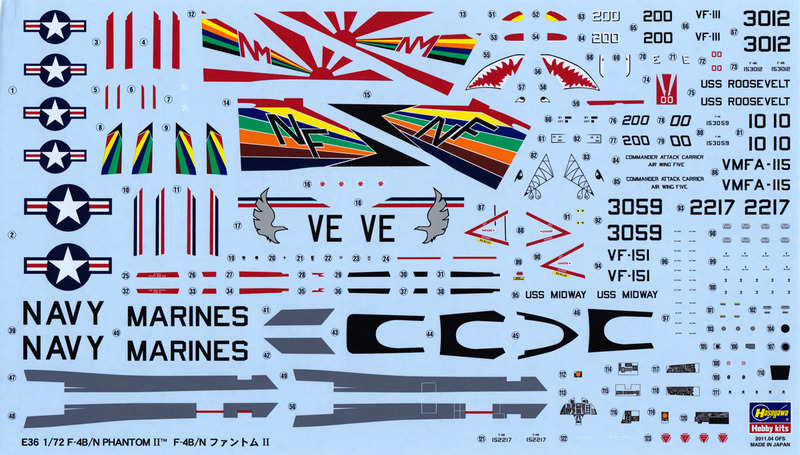 The US Navy was the first operator of the aircraft, and the subject of this Hasegawa kit is the first main production variant, the F-4B (many of which were later upgraded to the F-4N standard). This is the classic Hasegawa F-4B kit from their extensive 1/72 Phantom line. Molded in light gray plastic, the kit features recessed panel lines throughout. As Hasegawa engineered this kit to make the maximum number of Phantom variants, there are a fair bit of parts destined for the spares box, but the instructions are quite clear on those by graying them out in the parts diagram. Like most Hasegawa kits, this one comes with the basic Phantom-specific underwing stores, directing the modeler to the Hasegawa weapons kits for the other options. Where the kit does not skimp is with the decals, though. This sheet is almost the size of the box and provides three very colorful options. Of course, like most aircraft kits, construction on this one begins with the interior. While the Hasegawa kit has excellent exterior detailing, the cockpit interior is more typical of the era in which the kit was first released. This is identified by flat consoles & instrument panels with decals for the various dials and knobs. With the canopy closed, this will be plenty good enough, but for those who want to detail their Phantom kit, a set of photoetch or resin would help out here. The seats are a bit better, made up from five pieces, but they still lack the complex harness. Hasegawa did do their research, though, and provide an insert for the rear cockpit right console, which was covered up in the real plane. Once the cockpit is done, the next step is assembling the fuselage. The kit comes with a common rear fuselage assembly split in right and left halves, while the separate nose comes in three parts. The instructions would have the modeler assemble the nose and rear fuselage separately, but I would recommend gluing the front and rear parts together first, then assembling the completed right and left halves. This will give a better result on the mid-fuselage seam and hopefully eliminate any potential step that would be a pain to fill. The next step is putting together the air intakes. These are large intakes, so it is nice to see that Hasegawa provided the small pitot sensor for inside the intakes. The splitter plate is made up of two pieces, and all of this fits into place in a very positive manner. If you had assembled the fuselage as noted above, the addition of the intakes becomes easier as well, as there is now some extra wiggle room to get a good fit on those as well. The only downside to the intakes is that the kit comes with a solid face at the end of the intake on the inside, and that will be fairly visible with the large intake opening. That said, some careful painting, shading it from a light gray to a very dark gray on the inner edge, could greatly minimize that slab appearance. Other fuselage details provided include multiple fin caps depending on the antenna fitting. Pay attention to your specific Phantom subject to make sure you get the right fin cap. There are also intake antenna bumps, as well as various antennae for the fuselage spine. As the rear fuselage is a generic one, used for the RF-4 as well, the photo flash doors are separate. As it is easy to get these set wrong, a trick I've learned is to drill a hole in the center of the opening, push a piece of styrene rod through it, and then glue the door piece to the rod. You can then adjust the piece carefully to get a perfectly flush fit by sliding the rod in and out. Once it's just right, a touch of glue on the rod around the hole will keep it in place. The wing assembly is simple, with a one-piece lower wing providing the lower fuselage as well as the wings. The upper wing halves are separate, as are the outer pieces. The tabs on the outer wing pieces are pretty solid, so there should be no problem with getting them set at the right angle. The tailplanes do not have that luxury, as they have just a simple peg, so be sure to follow the instructions there and ensure you have those set at the proper 23-degree angle. The landing gear is good right out of the box, with good detailing and nice wheel hubs. The final bits include two wing fuel tanks, a centerline fuel tank, and the two inboard pylons, complete with dual Sidewinder rails. Where this kit really shines is with the decals. As noted earlier, this is a big sheet, and it has three very attractive subjects. All are finished in the standard USN camouflage of gull gray over white. The first is the boxtop aircraft, the sharkmouthed VF-111 F-4N off the USS Roosevelt. This aircraft is a CAG bird, with one of the rays of the sunburst on the tail containing all the CAG colors. There is also an option provided for the aircraft as seen in 1976 during the Bicentennial, with a small '76 trimmed in stars fitting into the sun. The second option is an F-4B from VF-151 off the USS Midway. This aircraft is also a CAG bird, with a much more flamboyant display of the CAG colors, covering the entire vertical tail. A simple black outline sharkmouth is on the white radome, while rainbow colors are duplicated on the wingtips. The final option is more sedate, although still colorful. This is an F-4B from VMFA-115, and it features a white tail with the silver eagle and red, white, and blue stripes. Those stripes are repeated on the wingtips. All three options are great subjects, and the decals are beautifully printed. In addition to the aircraft specific markings, the sheet comes with a good selection of stenciling. This is really essential, as it is those small markings that help break up that large expanse of gray and white and add to the realism of the finished model. The Hasegawa Phantom series is a great one, both for its overall detail and its overall breadth. 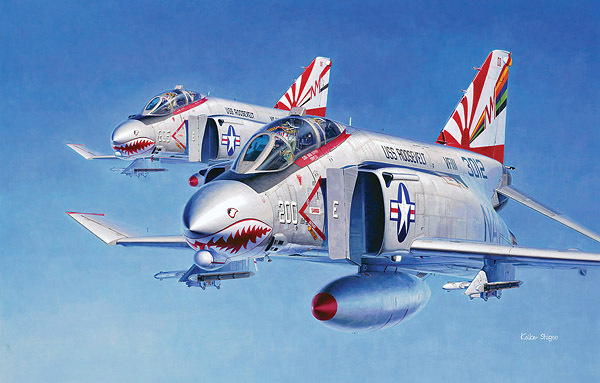 The F-4B/N variant is one of the most colorful out of the family, and this re-release from Hasegawa is very welcome. My thanks to Hasegawa USA for the review sample.